There’s nothing like a fresh Salesforce release to reassure SF consultants who, gainfully distracted by quotidian customer requests, have had their impetus to innovate temporarily quenched. Translation — I love working on a platform that innovates faster than I can. Before Richard Vanhook jumps out of his skin (check out his excellent idea posted over a year ago), let me assure you that Salesforce has NOT added a much needed Apex API for Custom Labels / Translations. However, with Spring 12, it HAS finally enabled us to use Visualforce to dynamically render and use Custom Labels — and associated Translations — when the Label name is NOT known beforehand. Rebranding the UI — At Skoodat, our trademark is design-oriented products, so we’ve done some heavy-duty overhauling of the standard SFDC UI, and have built a custom markup language to dynamically drive the content of our pages. 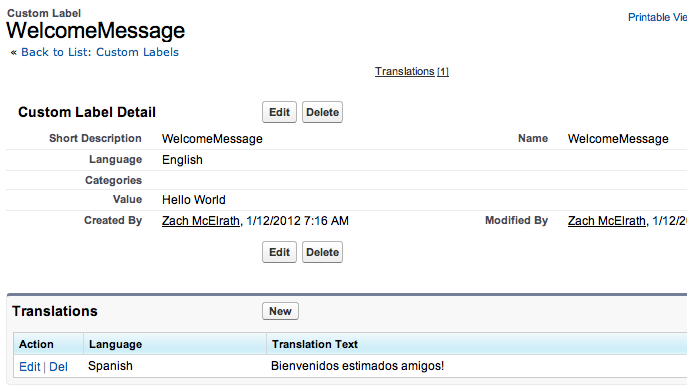 Having the ability to dynamically insert text that automatically gets translated into other languages is a huge win, and the triumvirate of Salesforce’s Translation Workbench, built-in multi-language architecture, and Custom Labels, really makes the implementation of this fairly painless. HOWEVER, for an ISV Partner interested in rendering pages dynamically based on custom metadata, this whole architecture is inaccessible, because there’s no way to access the value of a Label or Translation through Apex by name, i.e. there is no equivalent of loosely-typed System.Label.get('MyLabelName') … only the strongly-typed System.Label.MyLabelName . 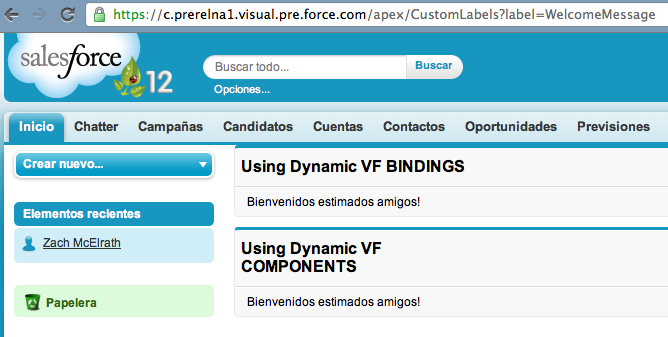 Dynamic Visualforce Components (which are finally Generally Available [i.e. not Pilot, not Beta] — and thus Packageable!!! This controller reads in a query string parameter called ‘label’ and assigns it to a page property (which we will retrieve from Visualforce using a Dynamic Binding), and then instantiates a new Dynamic OutputText component, setting the value property to the VF expression needed to retrieve a Custom Label. In this page, I first use Dynamic VF Bindings to access the $Label Global Variable, which, as of Spring 12, can now be used with Dynamic Bindings to retrieve an arbitrary label name. I then display the Dynamic Component. For those of you who joined the Dynamic VF Components Pilot, this functionality technically has existed since Summer 11. In my mind, however, this is really a feature that would most appeal to ISV’s, so the inability to use it in Managed Packages sidelined its appeal until Spring 12.